Those who have been following me know that I have been "tweeting" and doing some public relations work for my new client, Tribarter, an online barter site that allows members to trade goods and services. Tribarter is a great company to work with and also a great case study for several reasons. First, it's a green company, which in this day and age of plastic garbage bag "islands" in the middle of the ocean, distressing climate change statistics, and threats to the environment such as the BP oil spill and other frightening news, makes it instantly relevant. Also, in a tough economy where most Americans are struggling to make ends meet, an eco alternative to buying new, that is also easy on your wallet, is a welcome endeavor. The fact that Hedi Katz, CEO, stands out as an entrepreneur and recently was invited to join Astia, the prestigious global nonprofit that promotes women in business through training programs and funding, speaks volumes about her and about Tribarter. Tribarter had a Twitter account, but with very little activity and few updates and followers. My approach in tweeting was a combined strategy not only of "green tweets," through links and resource information, but also direct communication with influencers in the green online space. I was keenly aware that numbers don't tell the whole story, so I didn't merely look for those with large followings, but those who were being retweeted on a consistent basis, had frequent "sticky" updates that stood out, and were not shy about mentioning and linking to others. I noticed a definite upswing in followers when I made these direct connections. Plus, it was a great learning experience for me to observe, listen, and take in the twitter style of those outside my immediate world of communications, social media, and online marketing. What a pleasure to get to know some of these folks. 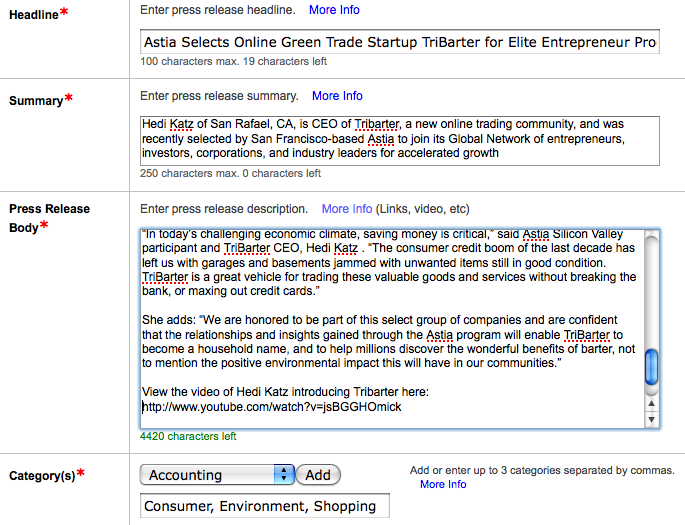 While I did tweet direct links to Tribarter's introductory video, featured products, and other direct links to the site, I was conscious of not being overly advertisy as I knew this strategy would not be effective or sustainable for the long haul, and green issues and the environment are such important topics right now, that it all comes full circle in the end anyway. So, I thought about what I would want to know about as a green or eco consumer, and I varied the tweets quite a bit, ranging from photos of glorious sunsets, to cool videos I found about decluttering your home, as well as redecorating on a budget. I also had in the back of my mind back issues of O magazine (Oprah), where I remembered she devoted entire pages as a place to give the reader mental space, through gorgeous nature photos. I wanted to provide that feeling as well, so that's when I started sprinkling in the photos, videos, and slideshows, as well as discovering some great resources for green media and content, which I'm planning to publish in an upcoming post. In less than a month, we were excited about increasing from 7 to over 300 relevant followers! There has also been increased buzz and interest in Tribarter, resulting in more members, increased trades and postings, and a recent story in the Marin Independent and others to follow. One month in social media land is just the tip of the iceberg, so I'm excited about the months ahead and a great "ecofuture" for Tribarter. In the meantime, here are some tools I found handy in my work, some of them may be familiar to you and some not. I hope you find them useful in your media toolkit, and feel free to comment here and some of your favorite public relations and/or Twitter tools. While I had heard of CoTweet for several months, I didn't try it out until recently, and it's really been a great find. The program allows the user to set up multiple Twitter accounts simply by typing in the admin info on the account. I've been using the free version, which is allowing me to do what I need to, including toggling between my account and Tribarter's, scheduling updates for future time slots, retweeting and @replies, etc. The only limit so far is that it's restricted to Twitter and no other social media platforms, but that may change in future. You can also view the twitter streams for both accounts, as well as view direct messages. I highly recommend CoTweet if you're tweeting for multiple accounts. CoTweet also has its own social media act together -- I posted my enthusiasm on their Facebook page, and within a day had an enthusiastic comment back from someone on their team. Not so with a number of other businesses I've posted to on Facebook recently -- lessons learned. As I mentioned in a previous post, I used Social Oomph initially to get started -- the program has an easy interface for setting up and editing your direct message to followers, as well as scheduling tweet. It also lets you control whether you want an automatic follow for new followers or not, and has some good tracking statistics and tools. You can also receive e-mail digests of tweets that contain keywords that you specify, and gett an integrated view of your mentions and retweets across many accounts. With a paid SocialOomph Professional account (about $30 a month), you can schedule updates for your Facebook profile and pages, posts for your blogs, and find quality Twitter accounts to follow. Formerly Twitter Karma (with a name change just as of today, as it turns out), this program allows you to instantly see everyone you are following and who is or is not following you back. Type in your twitter handle, and you get a screen of all your followers in a fairly easy to read grid, including their most recent post. When I used this application, I saw that I was following some folks who hadn't tweeted in over a year, so it was time to say goodbye. A great and easy tool to clean up your account. If you don't want to scroll through lists of your followers and want to check out if just a handful of people are following you, this program works fine and is super simple. Just type in the twitter handles to find out if one is following the other, press Return, and you get a simple Yes or No. This is a fantastic tool for posting updates, tracking statistics, and easily viewing mentions, replies, and streams. 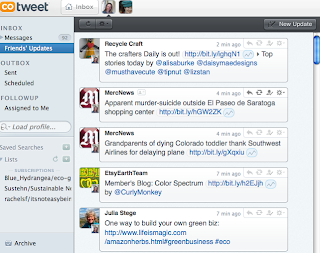 Unlike CoTweet which only has one preview window, Hootsuite has multiple column options, offering a multilayered Twitter experience. I find it easier to use then Tweetdeck, and I also like the Search function, allowing users to create customizable columns and feeds that conform to specific terms. and share through social media. The graphic shows their sample press release upload menu. I did a fair amount of research on press release distribution sites, and the easiest and most efficient so far is PRLog.org. This application has easy menus to follow, and provides many customized settings, a nice plus, particularly since it's free. Users can include up to 2 live links in a free account, plus embed video ( I had no problem embedding a YouTube link, although there are some positioning criteria that need to be followed.) I was also able to upload Hedi's head shot, and include information about myself as the publisher of the release, versus Hedi and Tribarter, the topic of the release. The press releases are submitted to Google News, and are supposedly fed to over 40,000 RSS feeds. I'll be interested in seeing the results over the next few weeks and researching search results. The original press release that highlighted Tribarter and Hedi's Astia award was a good foundation, but a bit confusing. In my revision, I did some tweaking that made a big difference in the readability and organization of the release. Visually, I added Hedi's photo with a detailed caption. 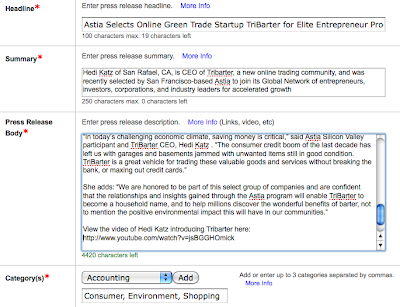 I also added Tribarter's logo to the page header to give it more credibility. I organized the quotes so they were more balanced throughout, and deleted several paragraphs that were redundant. I also added a subhead targeting the green focus of Tribarter, to highlight and tie in with today's green news being such a large trend. If you want to view the final version, you can catch it here. Last but not least, thanks so much to Hedi for this testimonial, a great way to start the New Year.